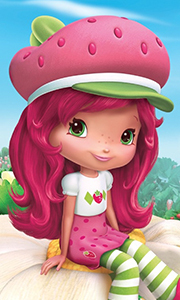 Whip up some good times with Strawberry Shortcake and her pals in this delectable collection containing three sweet adventures. When all the girls compete to make the best cupcake in honor of Berrykin Bloom for "The Berry Biggest, Berry Baddest Bake-off", they soon learn that there's one ingredient no recipe can do without: friendship. Cherry and Huckleberry discover that patience, practice and confidence work a whole lot better than a ..
Own Strawberry Shortcake - Berry Best In Show DVD from Deff, DVD, Blu-Ray & 4K Video Specialists - Free UK Delivery..
Own Strawberry Shortcake - Big Dream - Triple Set DVD from Deff, DVD, Blu-Ray & 4K Video Specialists - Free UK Delivery..
Own Strawberry Shortcake - Blooming Berry Garden DVD from Deff, DVD, Blu-Ray & 4K Video Specialists - Free UK Delivery..
Own Strawberry Shortcake - Bright Lights Big Dreams DVD from Deff, DVD, Blu-Ray & 4K Video Specialists - Free UK Delivery..
Own Strawberry Shortcake - Jammin With Cherry Jam DVD from Deff, DVD, Blu-Ray & 4K Video Specialists - Free UK Delivery..
Own Strawberry Shortcake - Puttin On The Glitz DVD from Deff, DVD, Blu-Ray & 4K Video Specialists - Free UK Delivery..
Own Strawberry Shortcake - Skys The Limit The Movie DVD from Deff, DVD, Blu-Ray & 4K Video Specialists - Free UK Delivery..
Own Strawberry Shortcake - The Berry Best Vacation DVD from Deff, DVD, Blu-Ray & 4K Video Specialists - Free UK Delivery..
Own Strawberry Shortcake - The Berryfest Princess DVD from Deff, DVD, Blu-Ray & 4K Video Specialists - Free UK Delivery..